How do international call forwarding numbers work? It’s really quite simple. Form the caller’s perspective, there is no difference between a virtual number and a plain old traditional number. The differences lie in what happens to the call before it gets to the recipient. When the call to a virtual number is made, it is connected to an international call forwarding service which is a cloud-based system. The service routes the call to one or more numbers chosen by the recipient. The caller and recipient may be located in different cities or different countries, but for the caller, the number is a local or toll free number. So, no long-distance charges or international dialing codes are necessary. Furthermore, as far as the caller is concerned, he or she has dialed a local number because while the call is being connected, the caller will hear a local ringback tone. For the recipient, an international call forwarding service is a great way to extend their business to cities all around the world at a very affordable price. International call forwarding services also have a lot to offer business people with a small budget, especially business people who are always on the go. For example, Gina Petrocelli is a purchaser for a women’s clothing store located in Manhattan. Her job involves traveling all over America on a regular basis to find new clothing lines. She also frequently travels to Europe to visit fashion shows. She chose an international call forwarding service because it enables her to be accessible wherever she travels, and also because the voicemail transcription service was a great help to her. As someone who is always on the go, it’s difficult for her to keep track of messages. Voicemail to email enables her to see messages at a glance and maintain a record of all her missed calls. One of the most significant benefits of an international call forwarding service is its price. Because data is stored in the cloud, there is no need for additional landlines, costly dedicated hardware, or expensive software. You also avoid the cost of paying employees when you need to upgrade or costly bills when you need tech support. International call forwarding services are completely scalable, which is a huge benefit when it comes to budgeting. You can increase or reduce your numbers as your business requires without penalties or a long-term contract. You are always in control of your international call forwarding service. With an international call forwarding service, your virtual phone communication can be set to triage calls based on numerous different factors. For example, you may want to have incoming calls routed to your office landline during business hours from Monday to Friday and then to your smartphone outside of business hours. If you have to travel, you can have calls directed to your hotel room, cell phone, or your customer service team. It is a simple operation using virtual phone numbers. No matter what day of the week it is, or the time of day, your customers will always be able to call the same number and get an answer, so they will know that you have a reliable company. If you have employees working different shifts, virtual numbers can help you there too. 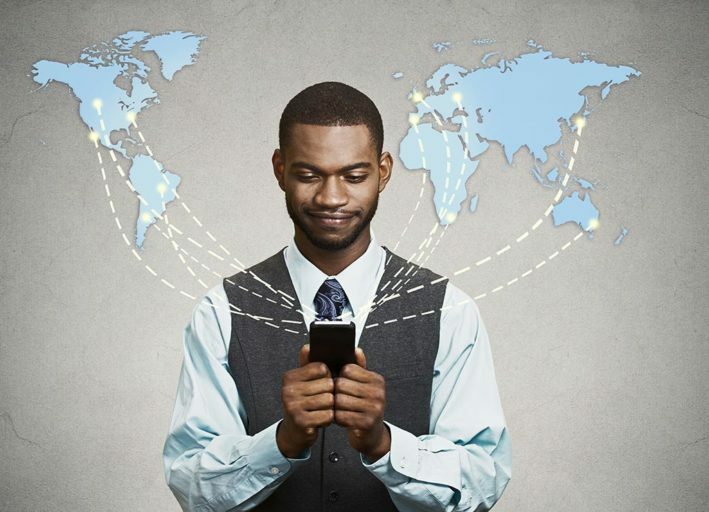 International call forwarding services can connect with your employees on their different schedules depending on the time zone from which the customer is calling. You can have calls routed to different employees depending on the time of the call. When they are on-call, they can have the virtual number linked to their smartphone. Let’s say that no one is available to be in the office or on-call. That’s not a problem. You can have incoming calls routed to an automated answering service. For example, you could use this to allow callers to leave a message (which can be emailed to you) or to hear pre-recorded information that could be helpful in the interim. You can also have calls rerouted to your personal number in case of emergencies. An international call forwarding service offers unlimited flexibility not only because of the cost-effectiveness and easy set-up, but also because of its flexibility and ease of directing calls. Customers have only one number to dial, and their calls reach a member of staff wherever they are in the world. You and your colleagues will never miss another call, wherever you are. Let’s say you are moving your business operations to a different city. It’s not a problem because you can still keep the same virtual number, so your clients will not be disrupted. Contact United World Telecom today to find out more about how international call forwarding services can help your business grow.